The Lower Devonian vascular plants preserved in the Rhynie chert, mostly in various states of decay but also life-like, have something in common: After the decay of soft tissue, several components are usually left: xylem strand, spore capsules, the highly durable spores, and occasionally the epidermis with cuticle and a narrow strip of adjacent cortex. This rule based on ample fossil evidence had to be modified with the discovery of Ventarura . This plant has invented a unique structural element which can be conspicuous on cross-sections as a concentric ring consisting of well-preserved cells, positioned within the cortex between central strand and epidermis, in the upper parts of the plant (Fig.1). The usually dark aspect of these tube cross-sections is due to the apparently thick dark cell walls which suggest an interpretation as a reinforcing element which increases bending strength and stiffness of the plant. Such interpretation is supported by the shape of the forking site of the tube, which seems to be optimized with respect to load-bearing capacity, as illustrated in Rhynie Chert News 3. Annotation 2019: Recently accumulated evidence seems to show that the ring, or tube in 3-D, is not for strength. 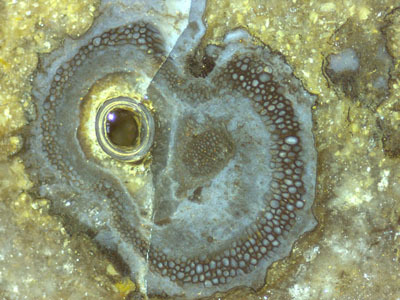 Fig.1 (right): Ventarura, 4mm across, on a cut face of Rhynie chert, with shrivelled surface, dark ring of well-preserved cells, xylem strand, and quartz-lined cavity replacing part of the decayed soft tissue. Picture taken under oil with a bubble creeping out of the cavity. Fig.2 (left): Ventarura fragment with distinctly seen cells of the characteristic tube. 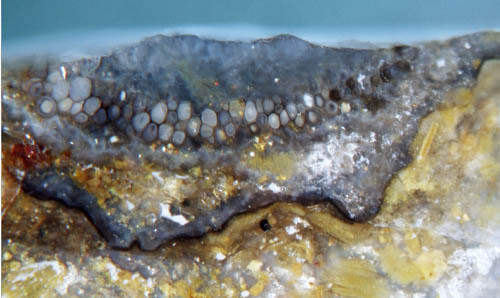 The well-preserved cells forming the cylindrical tube do not always look dark and thick-walled like sclerenchyma. In Fig.2 they are thin-walled and mostly pale inside. Fig.3 (right): Ventarura, hollow before silicification, shrivelled outside, no effect on the characteristic cylindrical tube 5mm across, uncommonly pale, one third broken away. Apparently the pale tubes are found in a few specimens only (Figs.3-5), among them those which are not shrivelled (Figs.4,5). It is suggested by the latter and other observations that all tubes were pale at first and became dark later. From Figs.2,3 it is also apparent that the characteristic cylindrical tube retains its shape while the tissue within and without vanishes. The space left by the decayed tissue between tube and epidermis is either left open, filled by mineral precipitate, or vanishes by shrivelling of the decaying epidermis with cuticle. 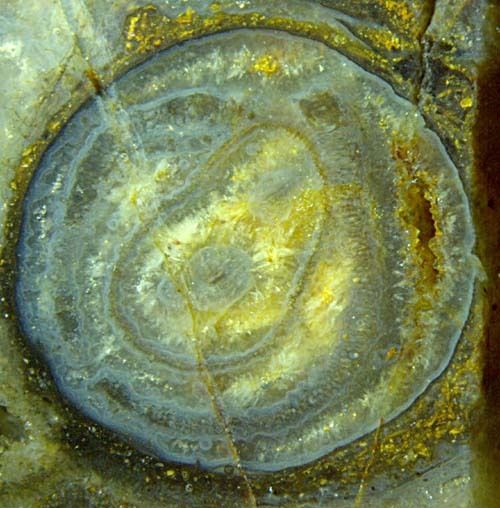 Fig.4 (left): Ventarura cross-section of uncommon structure and preservation: 5.5mm across, not shrivelled, two pale concentric tubes consisting of preserved cells, the inner one non-circular with two conducting strands inside, quartz-lined cavity replacing part of decayed outer tissue, yellowish quartz in cavities left by decayed inner tissue. 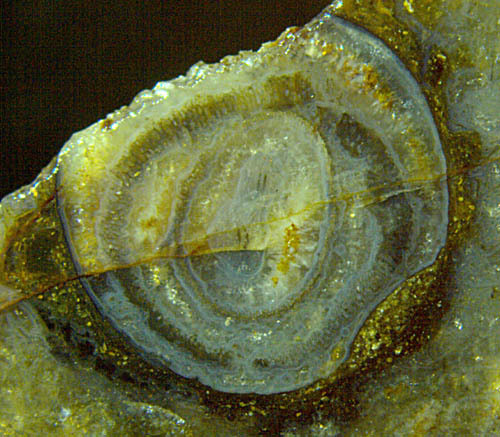 The arrangement of tubes, on cross-sections seen as concentric rings in Figs.4,5, the inner one non-circular and thin, is incompatible with the simple forking as illustrated in Rhynie Chert News 3. Possibly Ventarura is able, similar as Trichopherophyton, to grow new sprouts within old parts: Rhynie Chert News 82 . The persistent tube cross-sections may not be closed rings everywhere, as seen below in Fig.5. Note the discontinuity of the outer tube and the combination of tube sections with pale and darker aspect. Fig.5 (right): Ventarura cross-section, same shoot as Fig.4 but cut at lower position. - Before silicification, the upper parts of Ventarura had been either shrivelled (Figs.1-3) or smooth and cylindrical (Figs.4,5). possibly a thin deposit stained black (Figs.2-5). - The characteristic tube consisting of decay-resistant tissue, usually seen as a dark ring on cross-sections, can be pale and inconspicuous. - The apparent strength of the tube may be an illusion due to the weakness of the decaying tissue around. - There are exceptional cases of two concentric tubes, the inner one being thin-walled. - Irregular-shaped thick coatings with abundant debris enclosed, surrounded by much cleaner chert (Figs.3-5), are probably of microbial origin. Since the persistent tube tissue is neither connected to the epidermis nor to the central strand, the question arises how it is brought about, and for which purpose. Hence, any finds of Ventarura in the Rhynie chert deserve particular attention as they may lead to an answer. 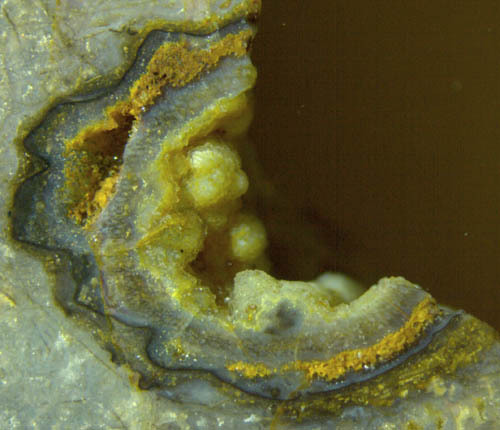 Also it would be interesting to know whether a tubular component of the type found in Ventarura is unique or present in some other fossil or extant plant, too. It is thinkable that a tube-shaped part of the cortex tissue had been made poisonous to fend off any intruder, be it fungus or sap-sucking creature. As a secondary effect, the tube might have persisted while the cortex generally decayed. The thin persisting cell walls may have become colonized by microbial layers superficially looking like thick walls. The decaying microbes may have stained the layers dark and mislead observers into the assumption that the tube with apparently thick dark cell walls is sclerenchyma. A different type of tube, a hollow straw with or without epidermis preserved, is often seen with Aglaophyton.